HERE I AM IN CHICAGO, getting ready for the big event tomorrow morning. Am I nervous? No way – I am pumped for this! My biggest concern was trying to figure out which trains to take downtown so I could pick up my race packet. It turned out to be easier than I’d thought. The hotel is providing a free shuttle service to and from the Forest Park Blue Line station, and the train got me close enough to the Expo, through the walk through McCormick Place was so long I was tempted to ask for a finisher’s medal just for getting there. The last few miles were tough, but I made it! 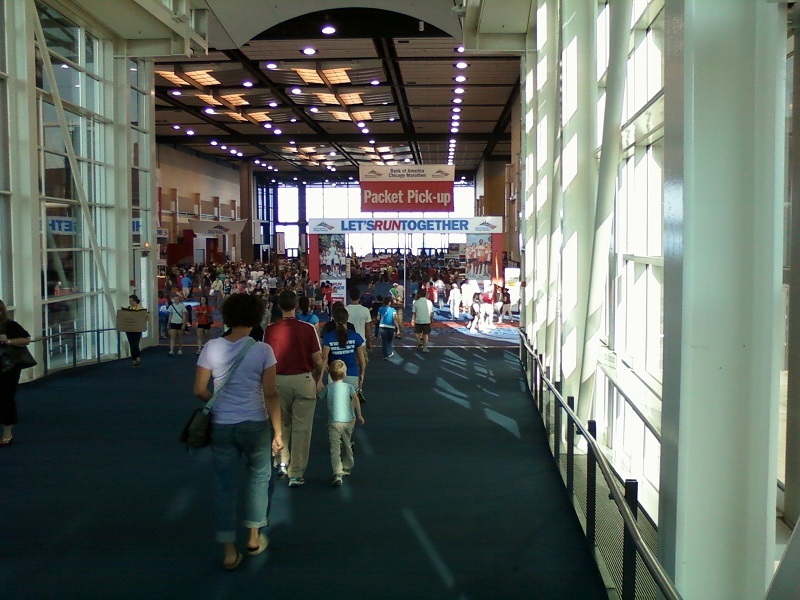 The Expo was mainly booths selling running gear and various energy bars and gels. But what else would you sell at a running expo? Cars? Oh, wait, there were a bunch of Volkswagens on display in the middle of it all. Where the tie-in is to marathons is I’m still not sure. The Devil wears Prada, but angels prefer Brooks. The running shoe manufacturers were all very excited to show off their new lightweight, minimalist models. The “barefoot running” movement has really taken off, and the big boys are frantically trying to catch up with Vibram (of the Five Fingers fame). The Saucony Kinvaras I’ve trained with all summer are this type – lightweight, with less support and structure than standard shoes, and they are what I’ll wear tomorrow. I will go back to a sturdier shoe once the snow starts falling, though. 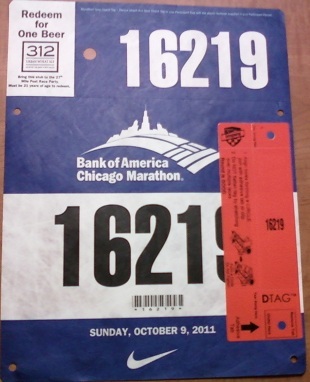 My official running bib. The orange stripe is the D-tag, which goes on the shoe and is used to track my start and finish times, as well as at points throughout the course (so there's no possibility of my pulling a Rosie Ruiz). My final tune-up run Wednesday night was fantastic; warm evening, flat route, and a body full of energy. I settled into a comfortable 8:00 per mile pace and wound up leading the group most of the way. The faster runners also had upcoming races and weren’t pushing the pace, but I still felt a kind of thrill being out in front. (I’m also glad I didn’t make any wrong turns.) At the end, I told Coach Marie that I felt good enough to run another six miles. “Great,” she said. “Save them for Sunday.” So I did. I get the feeling I’ll need them. For those of you who are interested, you can track me or other runners through the Chicago Marathon website, or by texting a bib number to 99731. 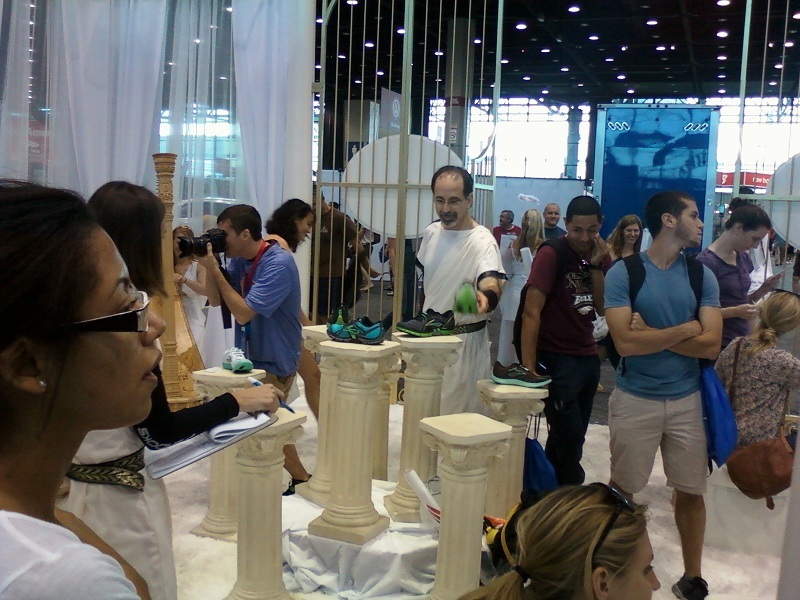 This entry was posted in Chicago Marathon 2011, Running & Cycling. Bookmark the permalink.